We made it! Yesterday we stopped drilling at Site U1347 because the drill bit was getting worn. Of course, we can’t see what shape it is in because it is at the bottom of the hole. But the plan is to keep drilling here and to do that we need a new drill bit. To change drill bits, we have to raise the drill string, piece by piece, back to the drill rig floor, screw on a new bit, and stick it in the hole way down at the bottom of the sea. So that we can re-enter the hole, the drillers put together a free-fall funnel. It’s just like the funnel that you use in your kitchen, except that it is 10 ft tall, 6 feet wide, and made of steel. So last night, the drillers put together the FFF around the drill pipe, which was still in the hole at that point. 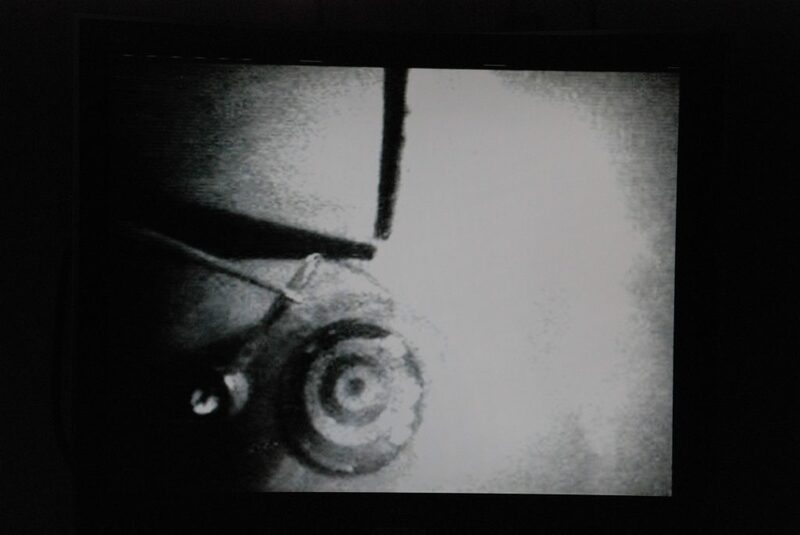 The FFF dropped to the seafloor and then the crew sent a camera down to make sure it was in place. The big test was tonight. Can we get the drillstring back in the hole? If we can’t, game over. The hole is terminated and we have to go someplace else. So we waited on pins and needles while the drill string was made up and the camera was sent down. It arrived at the seafloor and showed the funnel, almost buried in the muds that had been flushed out of the hole by previous drilling (they are soft and so the funnel sank in). But we could see the concentric circles painted in the throat of the funnel. Now the trick was to get the drill bit over the funnel. Easier said than done. In 3600 m of water depth, the drillstring is like a big, long strand of spaghetti. Now imagine taking that strand of spaghetti and dangling it from a 29 story building and dropping the end into a cup 2 inches in diameter. And don’t forget the wind – er – currents. It’s amazing that this can be done at all. It took a couple of hours of trail and error for the DP (dynamic positioning) pilot to move the ship slowly back and forth over the funnel, watching to see which way the drillstring would go. Several times the drillstring drifted past the funnel only a few feet away, but no go. Finally, at 10:52 pm, the string hovered briefly over the funnel. A command to the drillers dropped the drillstring several feet and down the hole it went. Whew! Tomorrow – more core from Site U1347.